This is our review of Planetary Herbals Horse Chestnut Cream. This products is meant to support vein integrity in the legs. 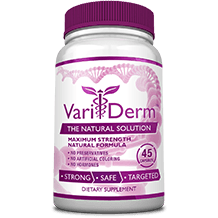 It is an herbal supplement that should tone tissues and help vein appearance. Horse Chestnut seeds contain escin which is supposed to strengthen veins and capillaries. It blocks an enzyme that usually breaks down part of the structure of capillary walls. Continue reading for our full review. Other ingredients include: Purified Water, Aloe Vera Leaf Gel, Glyceryl Stearate, Caprylic/Capric Triglyceride, Glycerin, Stearic Acid, Beeswax, Cetyl Alcohol, Cetearyl Alcohol, Methyl Glucoses, Lecithin Phospholipid, Jojoba Seed Oil, Tocopheryl Acetate, Benzyl Alcohol, Phenoxyethanol, Xanthan Gum, Grapefruit Seed Extract. The ingredients are full of antioxidants that help treat broken capillaries and varicose veins. They also are intended to strengthen blood vessels while helping to maintain healthy skin. It is recommended to gently massage the cream into your skin morning and night. for best results, use for 6 weeks. There are no possible side effects listed on the manufacturers website. You should test the cream on a small part of your skin for an allergic reaction before fully using it. If you are pregnant, may become pregnant, or breastfeeding, consult your healthcare professional before using this product. 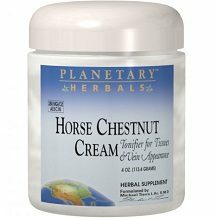 Planetary Herbals Horse Chestnut Cream is sold in a bottle of 2 ounces for $12.50 and a bottle of 4 ounces for $23.50. You are unable to purchase directly from the manufacturer. We were able to find the 4 ounces size being sold for $16.45 on another website. The label says you will see best results after using this product for 6 weeks. We don’t know how long either of these sizes will last you if you are applying the cream as recommended. You may need to spend a lot more money to see your desired results. All of their products are backed by a 100% satisfaction guarantee. You may return your product to where it was purchased if you have a quality concern. In most cases, the store will provide you with a replacement product or store credit. The manufacturer also will work directly with the retail store to resolve any issues. There were mixed customer reviews for this product. Many said that this product worked for them. One customer said it works but you have to give it 3-4 months to see results. Mostly everyone agreed that it has a very fowl smell when you apply it. There are a couple of positive things about Planetary Herbals Horse Chestnut Cream. It has a strong group of ingredients that have been shown to be effective in treating varicose veins and helping blood flow. There are also no known possible side effects which would give you more confidence that it won’t cause you any adverse reactions. There are things that concern us as well. The guarantee seems great but will vary based on which retailer you purchase from and therefore doesn’t show us that the manufacturer has complete confidence in the product’s effectiveness. Another thing that we weren’t so sure about was how long it would take to see results. The label says you would see results after 6 weeks but some customers said it will take 3-4 months. We don’t know how many bottles of cream you will need to buy to last you that long and therefore don’t know how much it will really cost you. We feel that there may be better options out there.